pH Balanced Gel Wheel Cleaner - Endorsed By Porsche. A wheel cleaning gel that sprays easily and clings to the vertical wheel surface for longer, giving increased cleaning power for soiled wheels. Most wheel cleaners rely on strong acids or alkaline formulas to give them their cleaning ability. 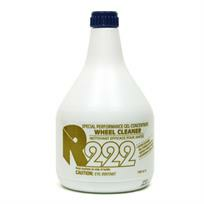 R222 Special Performance Gel Wheel Cleaner is different - genuinely pH controlled this wheel cleaner is extremely safe to use on any wheel finish. Spray head not included but available to buy separately here.